Most baseball seasons bleed into one another with little statistical recalibration required. For years at a time, “average” means almost the same thing, and we know at a glance whether a guy’s numbers are good. Every so often, though, the baseline shifts so significantly in a single season that the familiar signposts are swept away. Those are the years when the games get overshadowed by the offensive environment, and the extremes stand out in the statistical record like the boundary lines left by a rising or receding tide: 1930, 1968, 1987. The last such expectation-altering season was 2010, when run scoring sank by 5 percent, the average OPS fell 23 points, and the leaguewide strikeout rate broke seven per nine innings for the first time. In a callback to ’68, contemporary writers referred to 2010 as the “Year of the Pitcher” — another reminder that it’s easier to assess a season’s historical standing in retrospect than it is in the moment. The deeper drought in the four-plus seasons since the second so-called “Year of the Pitcher” has made that appellation look premature. Over the offseason, Major League Baseball welcomed a new commissioner, and with him, renewed debate about every reading that had fallen outside the “normal” range, including run scoring, strikeouts and the strike zone, and the length of games. We spent the winter wondering whether those trends would reverse themselves or proceed along the same path until officials intervened or the sport self-destructed. With only 9 percent of the season complete, that’s still an open question, but every plate appearance is part of the answer. Let’s check up on how the sport’s recent runaway stats have fared so far. Note: The data in this piece reflects results through Tuesday’s games. April isn’t just a small sample relative to an entire regular season; it’s also, in some ways, a skewed sample accrued under different conditions. The temperature is lower, which tends to suppress scoring by reducing batted-ball speed and distance and, by extension, BABIP and home run rate.1 On the other hand, the hitters are “ahead” of the pitchers early in the year, which tends to inflate scoring by giving batters more favorable walk and strikeout rates. The net effect is that April scoring tends to be slightly higher than the full-season rate. Theoretically, then, if we adjust the April results slightly downward, we’ll know what the year-end run-scoring rate will look like. Thus far, teams have averaged 4.22 runs (apiece) per game in 2015. If this season adheres to the typical pattern we’ve observed over the last 15 seasons, we would expect the full-season figure to settle at 4.19. That would be a bounceback from last year’s 4.07 — the lowest full-season rate since 1976 — to 2013 levels. The catch is that not every season cooperates by sticking to the standard month-to-month progression. Last year’s April runs-per-game rate was 4.21, but the dropoff from there was unusually steep. If this season follows last season’s example, we’ll be in for another lean summer of scoring. The good news is that there’s no bad news. If the last 15 years are a better guide than last year alone, offense will be up relative to 2014. Even if they aren’t, though, there’s nothing in the stats so far to suggest that we’re headed for an additional decrease. And after several seasons of seemingly inexorable decline — save for a tiny uptick from 2011 to 2012 — even a plateau would be a positive sign. Another persuasive explanation for the rise in strikeout rate and decrease in scoring over the past several seasons is the corresponding increase in fastball velocity, which has tangible benefits for pitchers (although it also leads to an elevated injury rate). Velocity is partially dependent on temperature, so fastballs are at their slowest in April. For a fairer comparison to previous seasons, we can limit the scope to April alone. The data below on four-seam fastballs comes from the PITCHf/x Leaderboards at Baseball Prospectus, with pitch classifications provided by Pitch Info. Pitch Info reports velocity 55 feet from home plate, a truer indication of release speed than the 50-foot readings MLB Advanced Media makes public, so the numbers are all slightly higher than those from other sources. Thanks to increased bullpen specialization and (presumably) improved training techniques and nutrition, big league pitchers have gained velocity in April in five of the last six seasons. This year, they haven’t, although that could change if April ends with a warm week. Maybe this means that pitchers are collectively coming close to maxing out their velocity potential. Or maybe it means nothing, like the one-year holding pattern in 2010 that gave way to four consecutive climbs. Ever since the PITCHf/x-based Zone Evaluation system began to be used as a tool to grade umpires, the strike zone has gotten bigger at the bottom without any shrinkage at the top, resulting in a much larger area that hitters have to protect. The increase in zone size is responsible for roughly a third of the recent drop in scoring, which reportedly put potential tweaks to the zone’s dimensions on the agenda for the Playing Rules Committee’s meeting prior to 2016. It should come as a relief, then, that the zone’s downward expansion seems to have halted, at least temporarily. Writing at FanGraphs earlier this week, Jon Roegele found the following size by dividing the area around home plate into 1-square-inch boxes and counting any boxes in which a majority of taken pitches were called strikes as part of the zone. Although the zone hasn’t given back its gains closest to the ground, it’s compressed enough in other areas that the overall size is smaller compared both to last April and to all of 2014. Since the strike zone hasn’t swollen more and the average velocity isn’t higher, it follows that strikeout rate wouldn’t be up, either. Encouragingly, it isn’t: Through April 16 of last season (roughly the same number of games, since last season started earlier), the K rate stood at 21.1 percent. Today, it’s only 20.2 percent. As noted above, strikeouts become more common as the season goes on, but thus far, we aren’t on track to set another record. That said, batters should still expect to see plenty of pitches at the shoe tops. Although some pitchers have discovered the virtues of confounding batters’ expectations by throwing high in the zone, that strategy is effective largely because most pitchers aren’t employing it. The average height of a pitch is as low as it’s been in any year for which we have pitch-tracking data, down almost 2 inches since 2009. To make the sport more accessible to potential fans who weren’t hooked on the snappier product of the past, MLB vowed to shorten games by making batters who stepped out of the box under certain circumstances subject to small fines and, more importantly, peer pressure. The league also resolved to cut down on the time between innings, after officials were “appalled to learn that breaks which were supposed to last two and a half minutes were often dragging three minutes and beyond.” Finally, baseball instituted a pitch clock in Double-A and Triple-A as a potential trial run for the majors. You’re probably wondering which players you have to thank for your new, precious free time. The following table lists the most conscientious, accommodating, and/or miserly players: the five batters and five pitchers who’ve lopped the most time off their 2014 paces, among qualified players in both 2014 and 2015. The pitcher time savings are slightly bigger because pitchers dictate pace to a greater degree than batters do, which leads to a wider range of times. 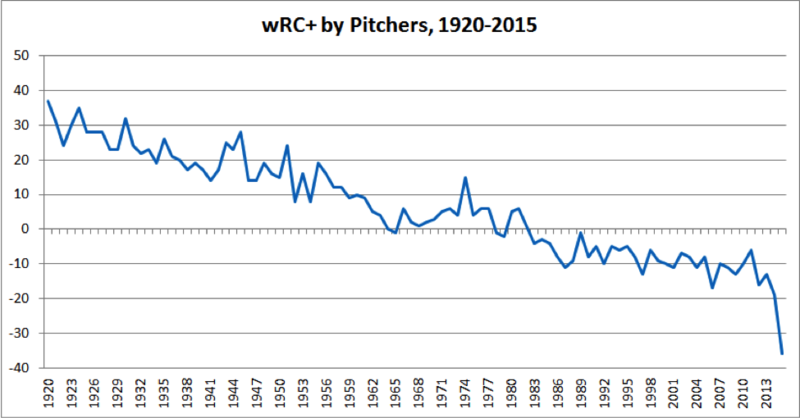 The takeaway: With a minimum of effort and invasiveness, MLB has managed to turn back the clock (more or less literally) to 2012, curbing the excesses of the past two seasons. 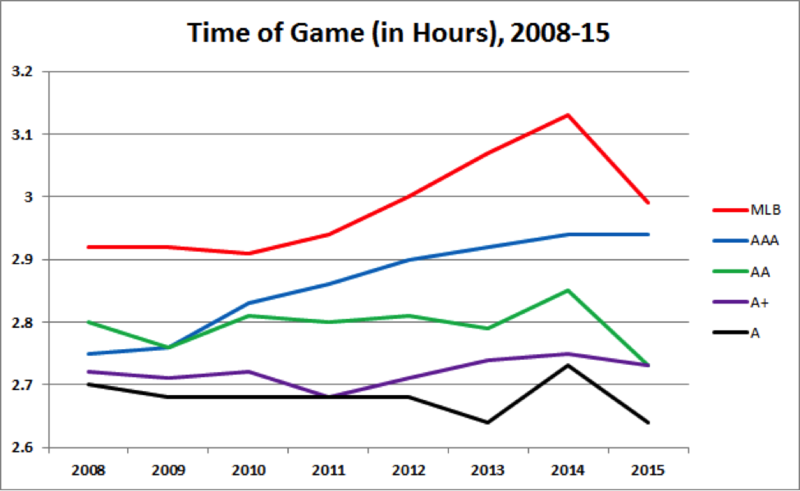 Games are still longer than they once were, and longer than the league would ultimately like them to be. But the inflation is under control, times are trending in the right direction, and the only one who has to suffer is Tuffy Gosewisch. Instant-replay reviews, incidentally, are averaging 1:51, down from 2:04 at this time last year, according to MLB spokesman Mike Teevan (maybe because managers don’t always have to trudge out of the dugout when they want to challenge). Last year’s end-of-year average was 1:46, so Teevan expects the current 1:51 time to improve. Having survived a brief offseason scare, defensive shifts are more entrenched than ever, with a projected increase in frequency of almost 40 percent over last season, according to Baseball Info Solutions. Three of those teams are under new general management. The Rockies, who shifted less than any other team last season, have done the math and amassed the seventh-most shifts in their first season under GM Jeff Bridich (as if an un-shifted infield of Nolan Arenado, Troy Tulowitzki, DJ LeMahieu, and accomplished scooper Justin Morneau weren’t effective enough). It’s no surprise to see the Dodgers up their shift rate after hiring the brains behind the Rays (who’ve also doubled down after years among the league leaders). In Bryan Price’s first year as manager, the Reds shifted less than they had under Dusty Baker, although Price had hinted at an increase. This year, he’s following through — as is Brad Ausmus, even though the Tigers manager downplayed expectations of more defensive movement this spring. Seven teams have bucked the trend by shifting less often thus far: the Rangers, the Brewers, the Marlins, the Royals, the Cardinals, the Indians, and the White Sox. Three of them — St. Louis, Chicago, and Kansas City — are nonetheless among the top 10 in lowest ground ball BABIP allowed. The Yankees, who rank sixth on this season’s shift list, have allowed the highest ground ball BABIP in baseball (.319); last year, they shifted more than all but two other teams but were one of only three that BIS didn’t credit with any shift runs saved. Either the Yankees’ shifts are working in ways that aren’t easily detected, or their infielders are setting a record for work without reward. There have been nine bunts against the shift this season, which puts batters on pace to top last year’s total. But they aren’t even keeping up with the increase in shift rate, let alone narrowing the enormous gap between shifts and shift countermeasures. Lefties (who face the shift more often) have pulled grounders a little less often, which might imply a change in approach, but the size of the sample makes that decrease difficult to trust. Which isn’t to say that there aren’t individual hitters waging their own private wars. Ian Kinsler, for instance, appears to have taken Ausmus’s anti-shift advice to heart. In February, Ausmus told the Detroit News, “There are a number of teams who shift that second baseman up the middle; I think he could take advantage of that.” Ausmus instructed Kinsler, a right-handed hitter, to work on hitting the ball toward second base, and Kinsler’s practice in BP has carried over to April. He pulled 61.3 percent of his grounders last season, but he’s down to 31.6 percent in a small sample this year. To this point, it hasn’t actually helped him. As a righty, Kinsler isn’t shifted like a left-handed slugger; according to BIS, he saw only 42 shifts last season (plus one this year). And as a guy with plenty of power to his pull field, Kinsler has a lot to lose by aiming the other way. As he put it, “I would like to neutralize those shifts … But you never want to change your approach completely or go away from your strengths too much.” Kinsler is an unlikely leader of the counter-shift movement, but if I can change and Kinsler can change, everybody can change. Surely some southpaw sluggers (other than Matt Adams) will follow suit. Something else to keep an eye on: In the past, the shift has hardly affected leaguewide BABIP, but BABIP is down nine points thus far this season, only five points of which can be tied to the typical April penalty. The designated hitter and the Astros’ move to the AL have played some part in the bunt’s endangered status, but much of its demise can be traced to a greater premium being placed on each out by stat-savvy front offices and field staffs. 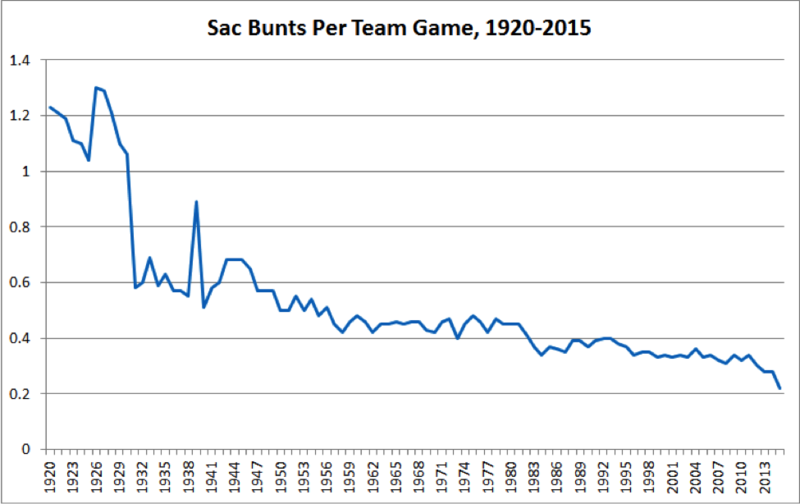 Admittedly, bunts have gotten a bad rap — they aren’t quite as illogical as early sabermetricians, who read run-expectancy tables and reacted viscerally to the widespread overuse of the bunt in earlier eras, declared them to be. There are times when sacs make sense, and those times are more common in low-scoring eras like this one, when hitters can’t be counted on to go deep or string together a series of singles (and when pitchers can’t be counted on to make contact when they swing away). Still, despite bunting’s benefits, there’s an opportunity cost to squaring away: not only the lost chance for a hit, but the time it takes to prepare for an event that’s becoming increasingly rare. Bunting for a hit will always be part of baseball, but sacrifices are an NL DH away from obsolescence. Have we had enough yet? I get it: Tradition is a big part of baseball. But civilization favors specialization, and so does sports. Players no longer manage. Managers no longer general manage. And pitchers — regardless of the rules that require them to — no longer hit. Pitcher plate appearances are starting to seem sadistic, so let’s call off the farce. Although the benefit of putting together a well-designed lineup rarely matches the vitriol directed toward the makers of imperfect orders, studies show that the second spot is usually the ideal place for a team to put its best hitter. Old-school managerial orthodoxy, meanwhile, holds that the no. 2 spot is the place to put one’s slappy contact type who can hit-and-run and make productive outs2 marginally more often than the next guy. For years now, sabermetricians have been waiting for the former belief to defeat the latter. To this point, the evidence of a second-spot awakening is strong. From 2002 to 2014, no. 2 hitters were never more than 2 percent better than league average as a group (with that modest high coming in 2014). This year, they’ve been 10 percent better. It’s not just Joey Votto, Mike Trout, Yasiel Puig, and Dustin Pedroia who’ve hit second regularly. It’s also habitual middle-of-the-order guys like David Wright and Carlos Gonzalez and high-strikeout-slugger types like Steven Souza, Jorge Soler, and George Springer. It’s still early enough that some unsustainable second-hitter hot streaks could be putting a thumb on the scale (I’m watching you, Mike Moustakas), but Freddy Galvis and Elvis Andrus notwithstanding, there aren’t many no. 2 hitters left who come from the traditional mold. The league’s growing appreciation of the second-place hitter and the record scarcity of sacrifice bunts could be connected. From 2000 to 2014 — or, for that matter, 1980–2014 — no. 2 hitters laid down 16.4 percent of all sacrifices, more than the hitters in any other lineup slot but ninth. So far this year, they’ve accounted for only 13.2 percent of sacs, tied with eighth-place hitters and just barely ahead of leadoff men. The hitters in one of baseball’s most selfless lineup slots are getting too good to give themselves up. That high-and-inside section, the only dark-red one for Trout in 2015? Right-handed hitters with a minimum of 100 pitches faced this season have seen 7.2 percent of their hard pitches faced in that box. Trout has seen 24.1 percent of his there, up from 12.1 percent last season. Not only has he more than tripled the league-average rate of hard pitches seen in that region, but the closest hitter to him, Jeff Francoeur, is way down at 14.9 percent. Break it down any way you want, as Sullivan did last week: high and inside or inside only; hard pitches or all pitches. Trout leads every list. Despite these extremes, Trout has been — say it with me — one of the best hitters in baseball, cutting down on his K rate from last year while maintaining his walk rate and showing the same power he did from 2012 to 2013. You can concern-troll if you try: Trout’s infield-fly rate is up, thanks to some swings under high pitches, and his overall line is propped up by a big BABIP. But if pitchers keep throwing him balls, he’ll become the on-base guy he was in 2013 — at which point the pitchers will come back over the plate and Trout will punish them. Trout is too good to have a hole that can kill him, but his opponents’ continued attempts to find one won’t ever get old. The season is still in its infancy, but based on what we’ve seen so far, 2015 isn’t shaping up to be a ’68 or an ’87. Instead, it’s looking like exactly what MLB needs: a breather and a chance to take stock, the roller coaster straightaway before the upside-down circle or the sickening plunge. Strikeout rates rise — it’s in their nature — so if 2015 does turn out to be a plateau, the league shouldn’t allow itself to be lulled into complacency. Still, it’s heartening to know that the genie can be wedged back into the bottle, and that not all of the sport’s streets are one-way. For a few months, at least, the crisis alerts can take a backseat to baseball. Thanks to Rob McQuown and Nick Wheatley-Schaller for research assistance. Which doesn’t mean that Tim McCarver’s global-warming theory made sense.